Recent release “Without Saying A Word” from Page Publishing author Bob D. Smith is both captivating and cultural; this work details the successes of the author, despite the obstacles. Bob D. Smith, a veteran, artist, founder of Blacksmiths Cards & Prints, Inc., devoted writer and author, has completed his new book “Without Saying A Word”: a gripping and potent work about the author’s ability to express himself without speaking. Published by New York City-based Page Publishing, Bob D. Smith’s telling work aims to be an inspiration and form of encouragement to the reader! Bob Smith recently passed in December 2015. As a member of the Los Angeles Society of Illustrators, in addition to being an award-winning advertising and editorial artist, he was an introvert. As a child living in Chicago slums, he rarely spoke. As a way of defining himself, he was determined to pursue his dream of becoming an artist, expressing himself through drawing. This dream became apparent as a young child scribbling pictures on paper bags. After serving in the military during the Korean War, he attended the Art Center College of Design on the GI Bill, which enabled him to attain success as an advertising and editorial illustrator in many commercial and entertainment venues in Los Angeles and Hollywood. 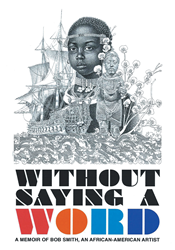 He additionally developed his own line of international Afro-centric greeting cards, Blacksmiths Cards & Prints, Inc.
"Without Saying a Word" tells of the success of an African-American introvert overcoming obstacles through single-minded tenaciousness and focus. This book can be an inspiration to millions of silent introverts who feel their aspirations are not attainable. Readers who wish to experience this inspiring work can purchase“Without Saying A Word” at bookstores everywhere, or online at the Apple iTunes store, Amazon, Google Play or Barnes and Noble.